Terenure Library will be hosting a series of talks by Maeve Casserly, Historian in Residence, Dublin City South Area. All talks are on Wednesday evenings and will commence at 6.30pm. Admission is free but booking is recommended as places are going fast. Terenure Men's Shed is part of the national men's shed movement which is a social inclusion movement for men designed to encourage discussion on health and wellbeing issues as well as reduce depression related illness in older men. It does this by facilitating meetings and group activities literally in a shed! Most Men's Sheds double up as workshops where members can gather and/or work on meaningful projects at their own pace in informal, "women-free" surroundings. 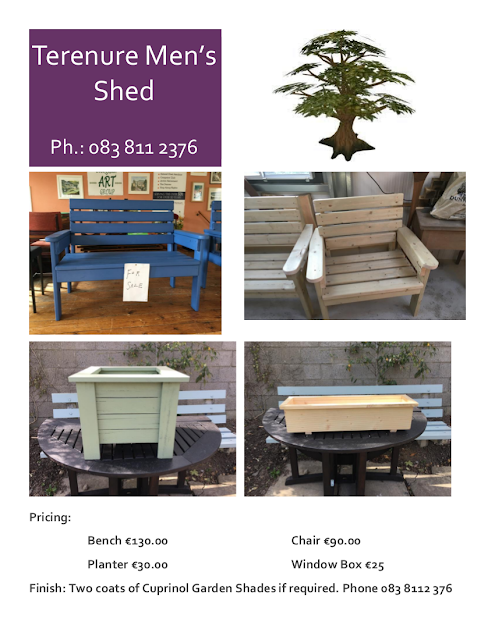 The Terenure Men's Shed is behind the Evergreen Hall on Terenure Road North, and they are now offering garden furniture as shown in their pricelist/brochure below. These are high quality items being sold for little more than the cost price of the materials to make them, and you are invited to support this worthy local venture by getting in touch with Joe on 083 811 2376.